Summer Milky Way This is what the sky would look like about midnite at the end of July, or about 10 PM at the end of August or about 2AM at the end of June. The shaded area running from southwest to northeast is the Milky Way. If you have never seen the Milky Way from a *dark* place, you should! The best conditions would be a dark place as far as possible from city lights, when the Moon is down. Your eyes need to be "dark adapted"- just sit in a dark place for 20 or 30 minutes. If you are on a camping or road trip this summer (particularly somewhere west of here), its worth the time to get a good view of the Milky Way- its our Home Galaxy. (1) Map of entire spherical Earth projected on flat sheet (2) Picture of whole celestial sphere projected on flat sheet Just as it is difficult to show the sphere that is the Earth on a flat map, it is difficult to show the whole sky on a flat sheet. To make the Earth map into a sphere, you would take the right and left edges of the map and bend them around away from you until they touched. Then you would have to crinkle the top and bottom into the poles. To make the sky picture look like the celestial sphere we are inside of, you would do a similar thing. But remember we see the sphere of the Earth from the OUTSIDE, but we see the sphere of the celestial sphere from the INSIDE. 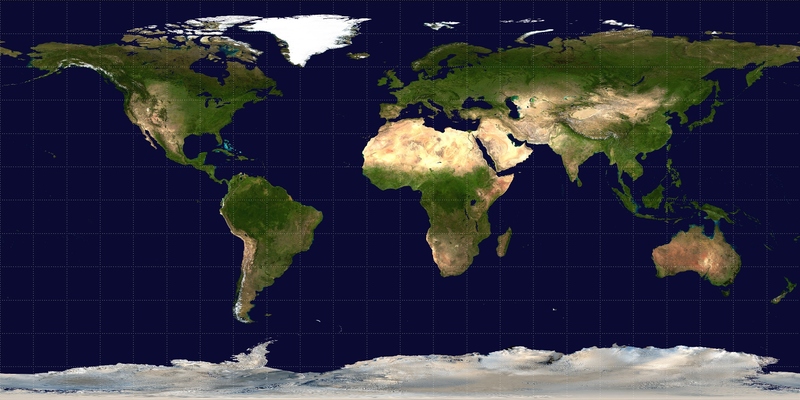 To put this Miky Way picture onto the celestial sphere (that we are in the center of) think about taking the left and right edges of the picture and bringing them TOWARDS YOU and then behind your head. 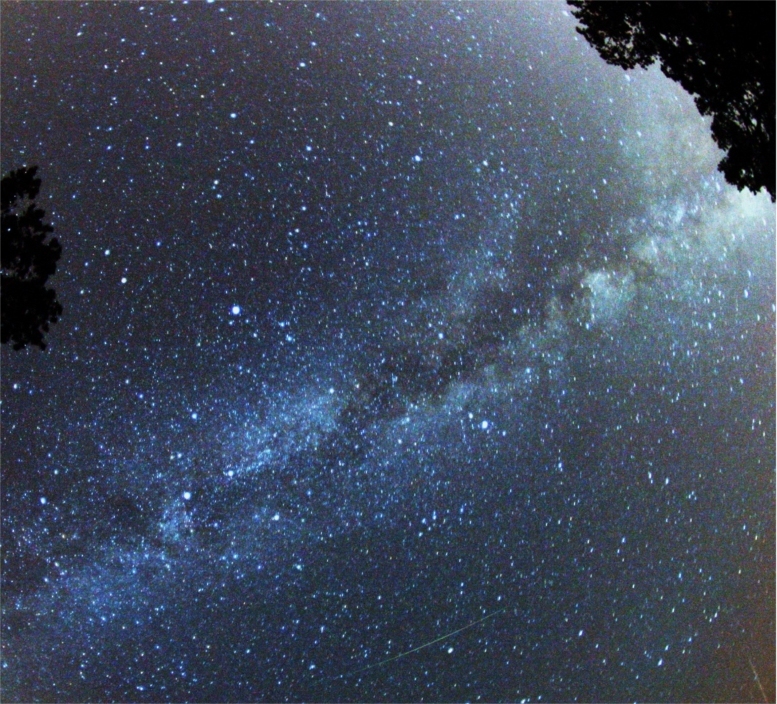 (1) Fisheye lens image of one half Milky Way (1) Fisheye lens image of one half Milky Way from Chile These are picture taken from cameras on the ground that show the entire sky (one half of celestial sphere) using what is commonly called a "fish eye lens". Both pictures were taken at a time when the Milky Way was passing overhead. 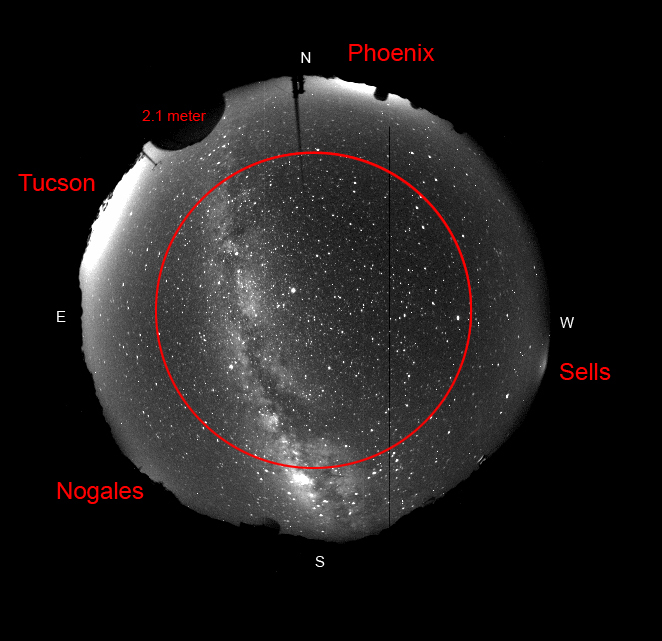 The first image was taken from Kitt Peak, an observatory in southern Arizona. The bulge of the Milky Way never rises very high and is at the bottom of the picture. The second image was made from Chile. 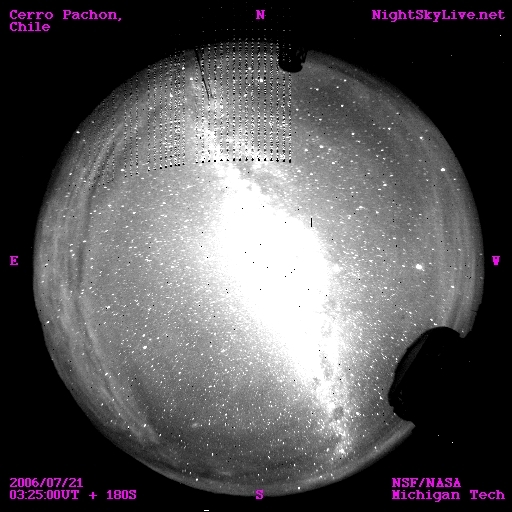 Because of the orientation of the Earth, the Milky Way bulge passes directly overhead from Chile and is seen in the center of the image here (which corresponds to the zenith). The random black dots and the grid of spots is a problem in the camera. From the ground, one can only see half the Milky Way at any one time, as the other half is below the horizon. (1) Fisheye lens image of Milky Way (2) Mosaic of images of Milky Way from Death Valley The first picture is yet another fisheye picture of the Milky Way arching overhead. The second picture is the entire sky. The arch of light is the Milky Way, which if you were there would have appeared to start at one horizon, arch up to the zenith, then down to the opposite horizon. 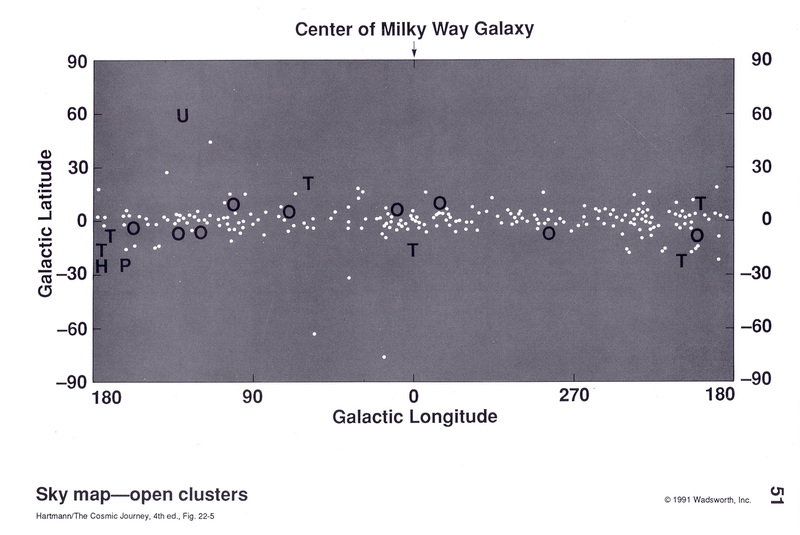 (1) Distribution of open clusters in sky (2) Distribution of globular clusters in sky These are "all sky" maps of open and globular clusters (each dot represents one cluster- ignore the letters). 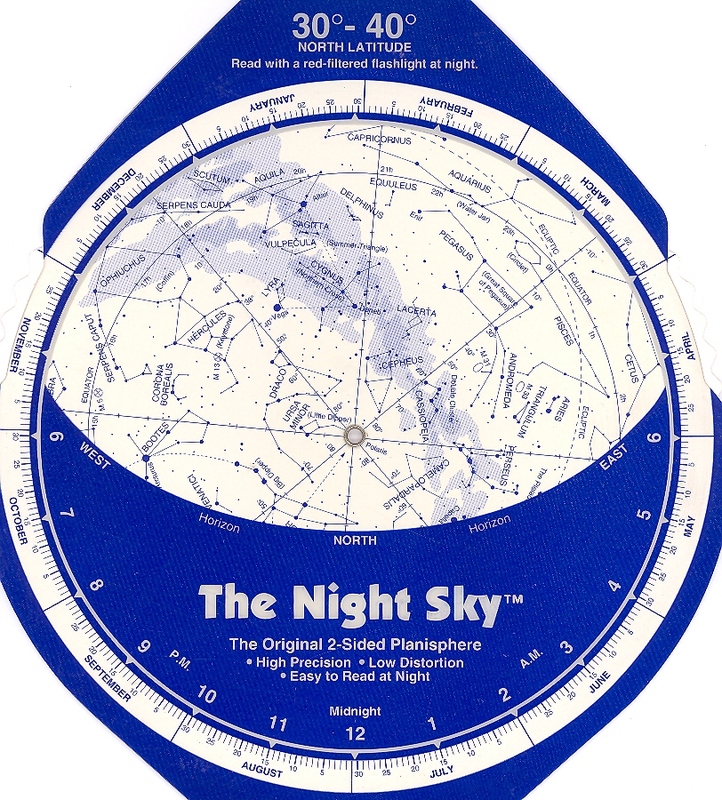 (Remember how these maps try to show the whole sky on a flat sheet, as discussed above). 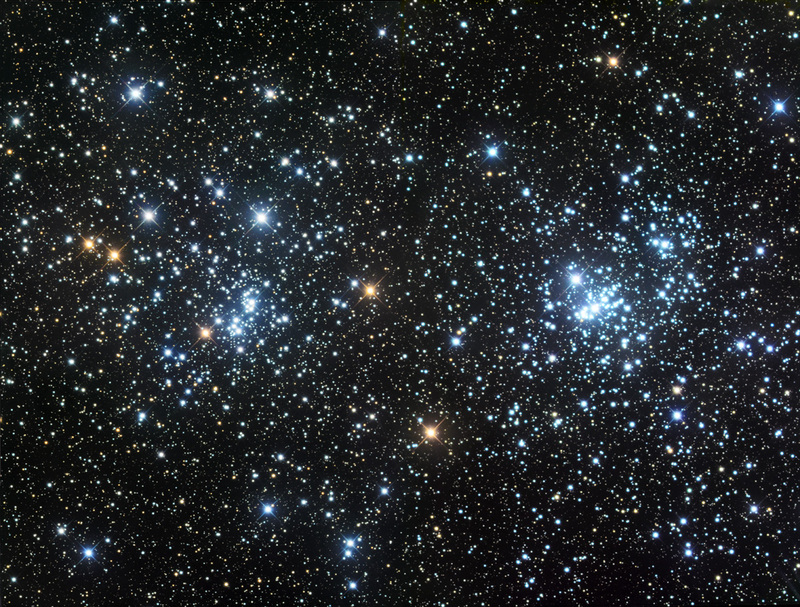 The open clusters would be confined to a band around the sky, and would look something like the fisheye images of the Milky Way shown above. If you were out in space, away from the Earth and Sun, you would see these clusters in a band that would circle the sky. 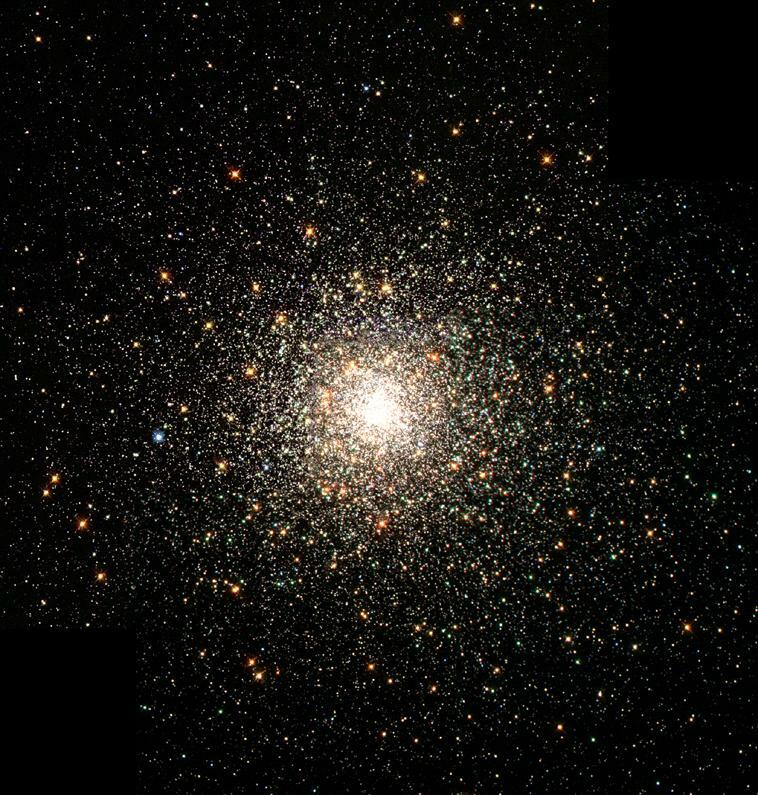 The globular clusters have a much different distribution- they would appear spread out over about one half of the sky. Side view of Milky Way This diagram shows a "side view" of the Milky Way. 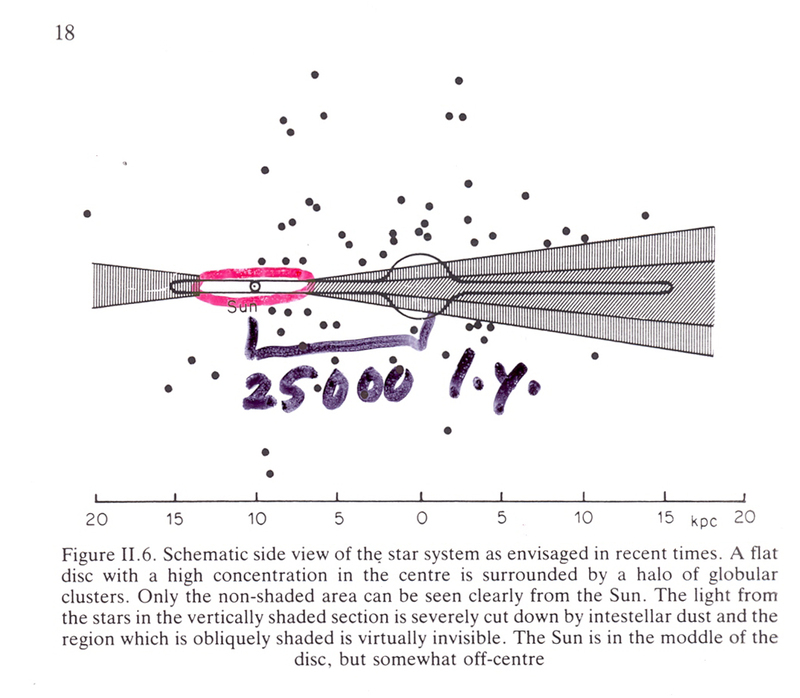 The red oval is what Herschel thought the Milky Way looked like - a "grindstone", with the Sun at the center. 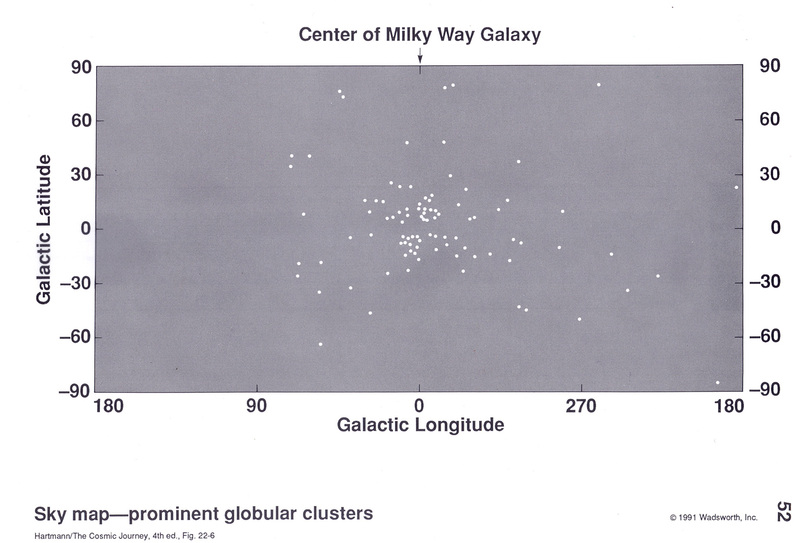 Shapley showed, using the distribution on the sky of globular star clusters (black dots), that the Sun was NOT at the center of the Milky Way, but rather is about 25,000 light years from the center. 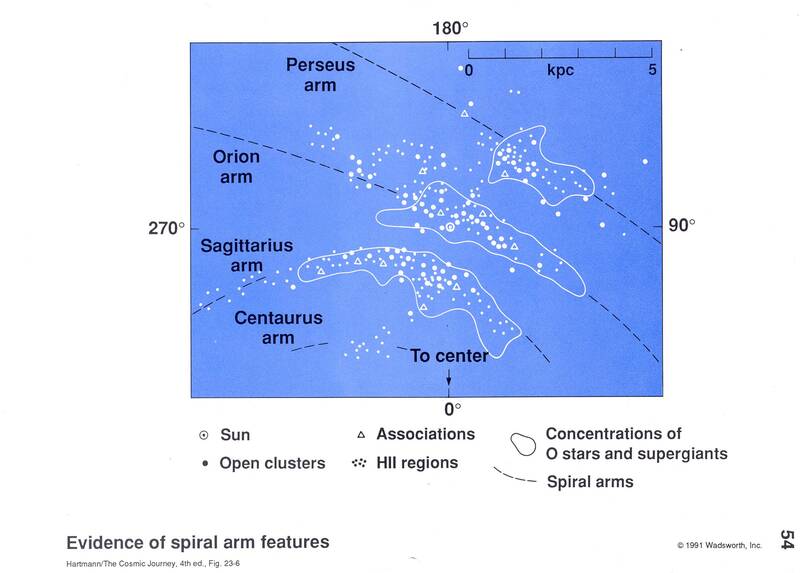 (1) Spiral arms near us in disk of Millky Way (2) Schematic map of spiral arms in our galaxy We have a difficult time seeing what *OUR OWN* galaxy looks like, as we are INSIDE IT. We can NOT travel outside the MW and look back to see what it looks like. 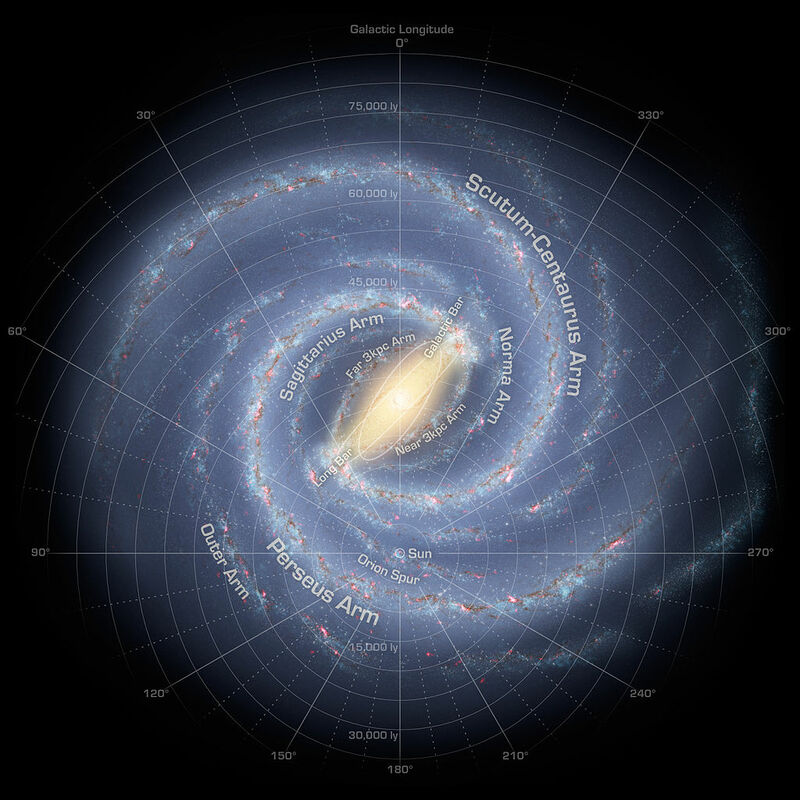 To get an idea of what the arms of the Milky Way might look like, we measure the distance and direction of youg stars and young star clusters and plot them on a picture like this. 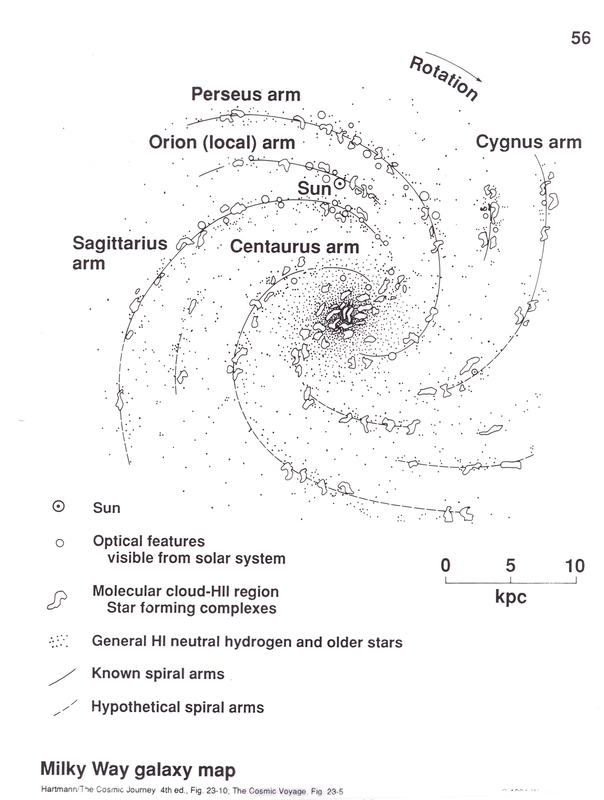 The second picture shows what we think the Milky Way arms might look like. Much of this knowledge comes from radio telescopes, as the radio waves penetrate the dust that makes it hard to see more than a few thousand light years in the plane of the Milky Way. Artist's conception of Milky Way from above This is an artists conception of what the Milky Way might look like if we could zoom out several thousand light years and look back on the Milky Way. We can't do this, of course! !